The picture in The New York Times showed a lean Arab man, kneeling at a window, aiming his sniper rifle out at the landscape below. 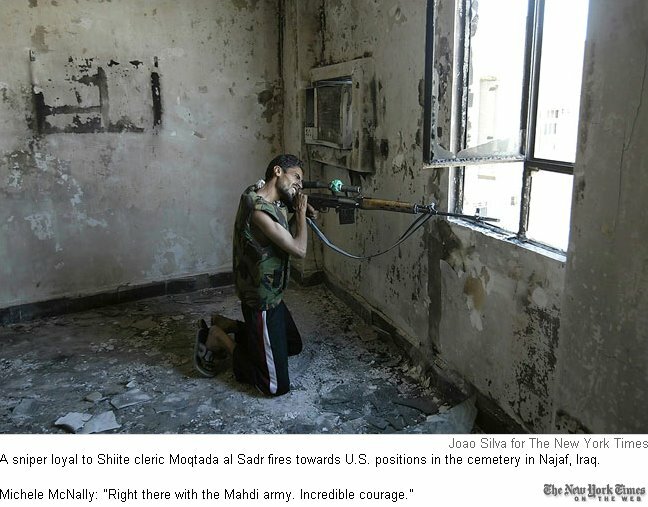 The caption reads "A sniper loyal to Shiite cleric Moqtada al-Sadr fires towards U.S. positions in the cemetary in Najaf, Iraq. Michelle McNally: 'Right there embedded with the Mahdi army. Incredible courage.'" In other words, a New York Times photographer was sitting idly by while a terrorist took a shot at American soldiers. In fact, the photographer, Joao Silva, did much more than just do nothing while an enemy of our country presumably put a bullet between someone's eyes; there was also the existence of premeditation. Mr. Silva was not simply in the right place at the right time--how does one end up in the same room with a Mahdi sniper?--but was tipped off beforehand that such an event was going to occur. What exactly happened, I don't know, but I suspect that the terrorist approached the photographer on the street, told him of his plan, and asked if Mr. Silva wanted to come along to get a really great picture. The photographer, lacking the moral sense of a two year old, readily agreed. I would argue that Mr. Silva is guilty of treason under article Article 3 of the US Constitution: "Treason against the United States, shall consist only in levying War against them, or in adhering to their Enemies, giving them Aid and Comfort". This is a clear case of providing "aid and comfort" to the enemy by way of his negligence. I would also argue that his actions make him an accesory to murder. Is Mr. Silva always in the right place at the right time? Of course not. He is friendly with local terrorist organizations, and local terrorist organizations are friendly with him, frequently asking him to come along on their murderous missions. Clearly the terrorists in Iraq know which side The New York Times is on. The very fact that this sniper thought to invite a photographer along with him on his escapades in Najaf is indicative of the tactics being used by the enemy in Iraq. Their tactic is quite simple--fill American news programs and newspapers with as much American blood as possible, and the American people will lose heart and go home. Thanks to the eager cooperation of such news outfits of The New York Times, this modus operandi has worked brilliantly thus far. Reporters consistently pretend to be oblivious to this fact, maintaining that they are simply observing events, not affecting them. Bull. The enemy is using our media for its own purposes with the full knowledge of editors and reporters. This tactic is spelled out in a memo found in the headquarters of Abu Musab al-Zarqawi, the recently killed head of the Iraqi branch of al-Qaeda. According the memo (which was likely penned by al-Zarqawi himself) , the terrorist organization plans "To use the media for spreading an effective and creative image of the resistance. " (emphasis added). Another al-Qaeda goal is "to create division and strife between American and other countries and among the elements disagreeing with it." Clearly, the Iraqi insurgency is fighting--and winning--a PR war. In other words, it isn't good enough to simply kill Americans; you have to get your picture on the front page of The Times while you're doing it. The idea that journalists have no greater duty than simply "get the scoop" is appalling. If The New York Times had had advance knowledge of the Septmeber 11th attacks, I hope they would have taken measures to stop the perpetrators, instead of just just making sure that they were in the best position to cover the attacks. While this comparison may seem extreme, it is not. If a member of the media possesses the moral blindness to stand by and watch one person get killed, why not three thousand? Or how about another hypothetical situation--if Dylan Klebold and Eric Harris had called a New York Times photographer (say, Joao Silva, for example) and told him that they were planning to shoot up Columbine High School, would Silva have had a moral duty to alert the police? Or would Silva have run through the halls of Columbine on the heels of the rampaging students, snapping pictures, and dreaming of Pulitzers? I hope he would have alerted the police, but with such a morally neutral stance, it's possible to justify just about anything. Actually, the press has a long history of moral blindness. In the 1980's, during a PBS "Ethics in America" debate, reporters were given a hypothetical situation--they are travelling with a ficticious army at war with the United States, and they come upon American troops. Did they have a higher duty to warn the Americans? CBS's Mike Wallace replied in the negative. "No you don't have a higher duty. You're a reporter." ABC's Peter Jennings initially answered that he would warn the Americans, but then changed his mind and agreed with Wallace. "I think he's right too," said Jennings. "I chickened out." The late Peter Jennings, incidentally, was Canadian, not American. So while I wouldn't expect him to act out of a genuine concern for his countrymen (his countrymen were not at issue in the question), I would expect him to act with some sense of decency, which I guess is too much to ask of a reporter. Another interesting quote from Jennings about his feelings on his neighbor to the south: "My mother…was pretty anti-American. And so I was, in some respects, raised with anti-Americanism in my blood, or in my mother's milk at least," said Jennings on CBS's Late Show with David Letterman. Not to speak ill of the dead, but Peter Jennings was a slimeball. Then there's reporter Peter Arnett who, at the time of the 1991 Gulf War, was a correspondent with CNN. In August 1991, just months after the end of the war, Arnett proclaimed on "Crossfire" that he would not have passed on information that would have saved American lives. "I would not have gotten that information in the first place, but I would not have transmitted it. I was in Baghdad because I was a correspondent for CNN, which has no political affiliation with the US government, thank goodness." While Arnett brags about the independence of his then-employer, other sources say that CNN is quite willing to be the flunky of another government, namely the government of Saddam Hussein's Iraq. By "other sources", I mean Eason Jordan, CNN's former chief news executive. In his April 11, 2003 New York Times op-ed, Jordan admits to making thirteen trips to Baghdad to convince the Iraqi government to to allow the continued existence of CNN's Baghdad bureau. Jordan admits that stories of attrocities were covered up, so as not to anger the Iraqi government. "Each time I visited, I became more distressed by what I saw and heard — awful things that could not be reported because doing so would have jeopardized the lives of Iraqis, particularly those on our Baghdad staff." (emphasis added). This is interesting. He's actually showing what appears to be a shred of journalistic ethics--admitting that getting the story is not worth getting people killed, which likely would have happened if CNN had reported the truth. But was this his true motivation, or was he just trying to keep CNN's Baghdad bureau open? I'll give Mr. Jordan the benefit of the doubt and say that he was genuinely concerned for the lives of his employees. Ironically, at least one of those employees (Peter Arnett) doesn't show the slightest concern for the lives of American troops, because CNN "has no political affiliation with the US government, thank goodness." But why not just shut the Baghdad bureau down? What purpose did it serve if the reports it gave were Saddam-approved mendacity? If that's the types of "news" I wanted, I would tune into Baghdad Bob. Incidently, CNN's reporting from Iraq probably didn't differ very much from Baghdad Bob's. In their zeal to get the story, American reporters have lost sight of a thing we used to call journalistic ethics. While some reporters pride themselves on their strict impartiality (a farce, if ever there was one), they are in fact engaging in a type of moral blindness that borders on criminal. Scratch that, it boldly crosses the line into the sphere of criminality. While eagerly falling prey to the attempts of Iraqi terrorists to bring the carnage of Iraq into American living rooms, they proudly wear their independence from the US government like some kind of badge of honor. Shame on the American media establishment.